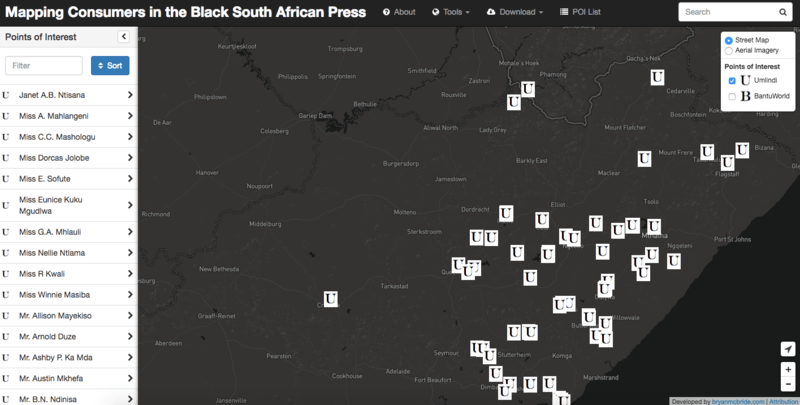 My project, Mapping Consumers in the Black South African Press, is now live at this address! Mapping Consumers is built with data I collected from two South African newspapers, Bantu World and Umlindi we Nyanga in the 1930s. The 1930s were an important period in the history of South African newspaper, advertising, and consumer culture. This was the period when white-owned consumer products companies began sustained advertising campaigns in newspapers for black South African readers. Testimonial advertisements in these papers offer a window onto who the consumers of these products were, how they imagined themselves as consumers, and how advertisers wanted to represent the ideal, “modern” African consumer. One of the things that was helpful about presenting this to an audience of strangers was learning which parts of my site are self-explanatory, and which need more context. I found myself having to explain the colourful marker clusters, which is a feature built into the Bootleaf template that I’m using. When there are more than a certain number of markers in a certain area at a certain zoom level, it will create a coloured cluster representing this group of markers. 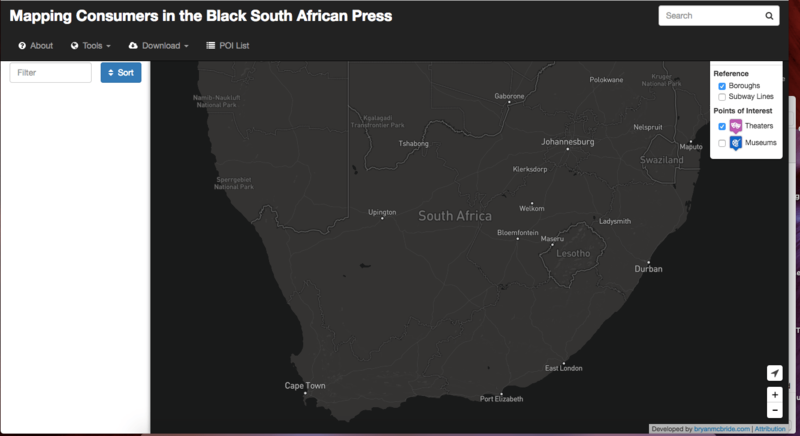 However, I realized while presenting that these clusters somewhat obscure the argument I want to make with this map — that testimonial-writers in the black press were from rural places all across the South African countryside. Another positive take-away from this conference was that because it was a World History conference, I was able to think in new ways about how my local South African project is contextualized in global history. My paper made the argument that testimonials show how local South Africans responded to global marketing campaigns (in particular the well-funded campaign for tea consumption put on by the Tea Market Expansion Bureau). Now that the basics of the map are there — markers for each testimonial advertisement in a newspaper, clusters for concentrated areas of markers, and a sidebar with click-able information — I want to add more complexity to the map to represent more information about testimonials and the history of consumer culture in South Africa. One of the things I’m interested in is highlighting differences between urban and rural writers of testimonials. Since I haven’t been able to find an appropriate historical map of South Africa from the time period, Ethan Watrall gave me the idea to create different-coloured markers for urban or rural locations. Now, I’m working on this task, using population information from the 1936 census. My goal is to represent urban or rural status using different coloured markers, with different shapes representing the different newspapers that the information comes from. Adding this additional complexity to my map will force me to consider exactly how to define “urban” and “rural”. One metric I’m considering is whether or not a town is listed in the 1920 census list of “towns and villages possessing some form of urban local government.” But this is perhaps a problematic category, as the structures of “urban local government” might have been granted differently depending on the racial make-up of a locale. In that case, my best option may be to pick a certain number that I consider to represent the border between urban and rural, and simply trust that the 1936 census gives a fairly accurate population count. So, my next step, now that I have the map displaying, is to link my geoJSON file containing the data about my pins to display. This will mean replacing all the code referencing geoJSON features with the features in my geoJSON file. Wish me luck! This past month in the CHI fellowship, we worked on a practice data visualization project. My group took data about regional sheep and human populations in New Zealand, and showed their differing ratios by region. 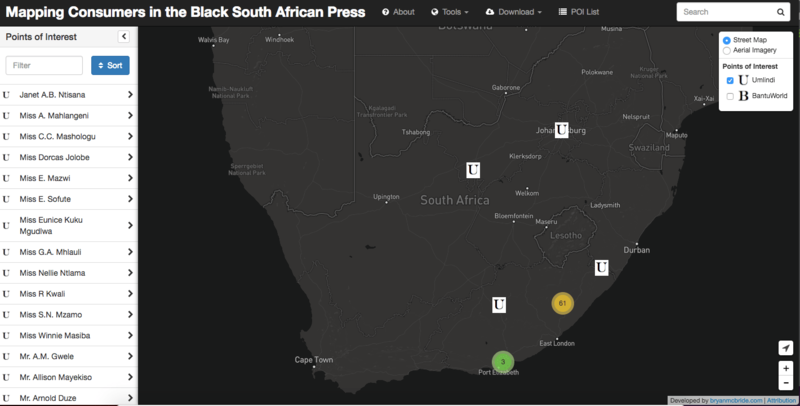 This got me thinking about the research that I do with South African newspapers, and what sorts of data from newspapers could be visualized, and what that would teach us about newspaper production and circulation in South Africa. Another CHI fellow pointed me in the direction of the Viral Texts Project (thanks, Laura McGrath!). This project shows how certain texts and news items were copied and shared between newspapers across the nineteenth-century United States. Some of their visualizations include a web visualization that shows a line between newspapers for every time that one paper copied material from another. Another of their fascinating visualizations is a sort of close reading of one particular viral text – a humorous love letter – which shows a single page of the newspaper and links to editorial comments explaining the context and linkages between certain phrases. This is my second blog post for the CHI fellowship. Today I’m thinking and writing about digital maps, and how those let us see cultural and social divides in the present and the past. Africa’s a Country, a website whose purpose is to counter that old mistake Western people make about Africa, recently published a piece about Johnny Miller’s aerial photographs of contemporary South African inequality. Miller’s photographs are taken from the air (what he called the “nadir zone”). The purpose of the photos is to highlight the spatial proximity of highly unequal communities, but also to show the powerful-but-narrow infrastructure barriers that divide them (highway ramps, fences, ditches). I’ve also spent a lot of time recently looking at South Africa from the air, but through maps – usually Google maps, sometimes a historical map of the Eastern Cape region in the nineteenth or twentieth century. Some of my research is about the history of migration – of people and commodities – in the Eastern Cape. A paper I’m currently working on investigates the circulation network of a particular newspaper, through the postal address information given by people who entered prize competitions in the paper. As I find addresses, I plug the town name into Google maps, to see how far away the place is from East London where the newspaper was published. But Miller’s aerial maps of inequality got me thinking about how my Google maps don’t show all the types of distance and difficulty that existed historically – the economic or infrastructural distances that might inflate the physical distance from point A to B. Some historical maps do this, by showing old road networks and political boundaries. But even they can’t show the degree of difficulty it takes a person to cross a boundary – a particularly salient problem in South African history when black people’s movement between urban and rural areas depended on a pass. One of the potential projects that I came to the CHI fellowship with was to map consumer/newspaper subscriber networks in early-twentieth century South Africa. But how would you create a map that showed not just physical distance, infrastructural barriers, and political borders, but also degrees of difficulty that it might take for a person or object to cross even a very short distance? Hello everyone, Katie Carline here. 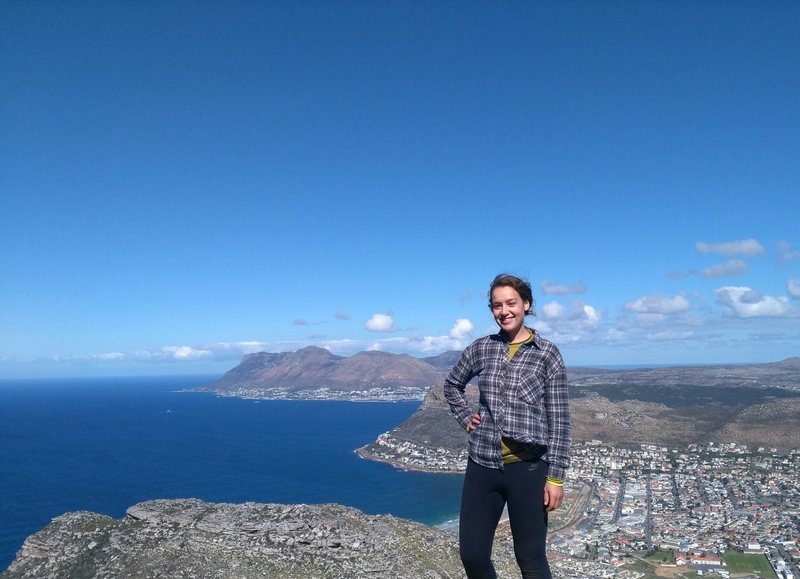 I’m a student of South African history in my second year of PhD studies in the Department of History at Michigan State. I look forward to blogging about my experiences in the CHI Initiative as I learn the tools of digital cultural heritage, apply them to my own research interests (consumer culture in early twentieth century South Africa), and reflect on my position within the wide network of South African digital history scholarship. And a wide network it is, too! South African history has a diverse representation in the digital sphere. At MSU I’ve learned from digital scholarship produced by my supervisor, Peter Alegi, and colleagues like former CHI fellow Liz Timbs, as well as many digital Africana projects by MATRIX. In South Africa itself, numerous digital projects aim to make history accessible to the public – from the independent volunteer-based encyclopedia South African History Online, to the massive digitization project at the University of Witwatersrand’s Historical Papers. Moreover, the Digital Humanities Association of Southern Africa recently established itself as a member of the Alliance of Digital Humanities Organizations. However, there’s no simple equivalence between the digital and the public/accessible. For one thing, not everyone has equal access to the internet. As I begin the CHI fellowship, some of the questions I’m reflecting on are: who is the audience for the digital project I create, and how will my work relate and compare to the many established digital presences in the world of South African history? My plan for the CHI fellowship, as it stands now, is to explore advertisements in black newspapers of the 1930s and 1940s. In this period, South African companies stepped up marketing campaigns targeted directly at black consumers. I’m especially interested in testimonial-style advertisements, where “real customers” had their photographs or addresses printed to advertise a product, like Mrs. Ntisana’s endorsement of Ambrosia Tea in the picture here. I think there are many interesting questions to be asked about this genre of advertisement – what sorts of people and products are advertised in this way? What does this tell us about consumer culture? About advertisers’ perceptions of black South African consumers? I look forward to exploring these questions, and thinking about digital cultural heritage answers to them, over the next year. Just one example of how, in South Africa, internet access shapes access to information and education: Toks Dele Oyedemi, “Digital Inequalities and Implications for Social Inequalities: A Study of Internet Penetration amongst University Students in South Africa,” Telematics & Informatics 29, no. 3 (August 2012): 302–13.